LAS VEGAS, NV. - After a windy weekend in Las Vegas, the Women's Falcons completed four out of their originally scheduled five exhibition matches against the Australia Pearls with 1-3 record overall. While Head Coach Richie Walker and the Falcons had hoped for better results, the ultimate goal of bridging the gap to the next HSBC World Sevens Series Stop, Kitakyushu Sevens, was achieved. "It was extremely beneficial to play against such a talented Australian side," said Head Coach Richie Walker. "We have learned a lot from fighting through the competitive adversity we faced this weekend. With such a long break between Series stops, it is important that we continue to condition our attack in preparation for another challenge in Kitakyushu." "To play a high-caliber team like Australia multiple times is hard to come by," said high-scorer Naya Tapper. "Usually at a tournament, you'll be able to play the best teams in the world at most once, if at all. Being able to test our abilities, see our strengths and weaknesses against the best, and use that knowledge to make ourselves better as a team was worth every minute played." Played in conjunction with the 2018 USA Sevens Tournament, the Falcons and Pearls faced one another once at Silver Bowl Park and another three times in Sam Boyd Stadium. Due to the unforeseen windy conditions in Las Vegas, both squads were forced to forego their scheduled matches on Saturday, concluding the series on Sunday with two in the main stadium. The Falcons conceded their first game 29-10 and took the second 26-12. Following Day Two's cancellation, the Pearls took both contests on Day Three 40-7 and 39-12 at Sam Boyd Stadium. "Though the scoreboard didn't reflect the results we wanted, our goal was to keep our senior players in the game and help further the development of newcomers," said Coach Walker. "Both sides gave it their all making this a valuable experience for everyone." Although all four games were played against the same side, both teams brought a mix of senior and developing players who rotated in and out of the lineup to create a unique dynamic in each match. 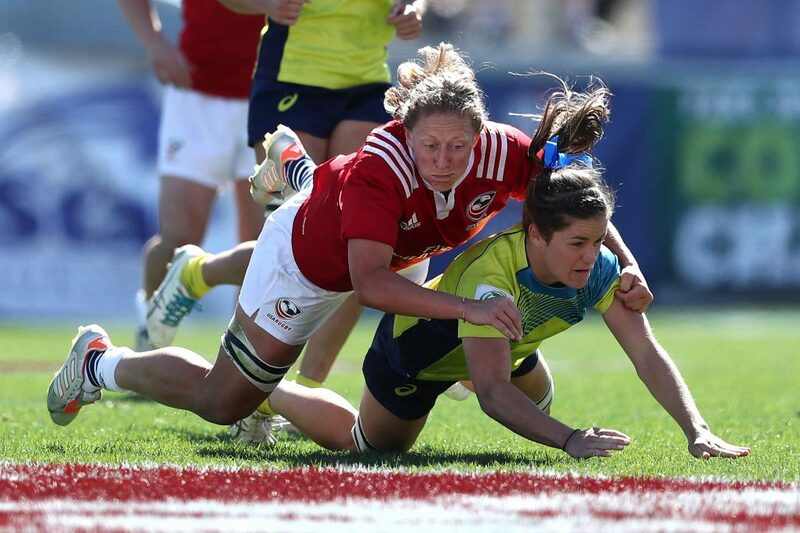 Australia's senior players most recently clinched the 2018 Sydney Sevens Title off the back-end of winning Gold at the 2016 Rio Olympic Summer Games, making the competitive landscape of the exhibition series constructive for the American side. "You'd think we'd get bored playing the same team every time but I loved every minute of it," says Naya Tapper. "Every game was essentially different. With a squad who can change there game style at any moment, we were forced to be adaptable as players which is very important in the game of rugby and is also one of our team values." The Falcons will now set their sights on being selected for the next HSBC World Series Stop - Kitakyushu Sevens - April 20-22. After taking the Silver in Dubai and finishing 8th in Sydney, the United States currently sits at 5th in the 2017-18 Women's World Series Standings. Kitakyushu Sevens will be broadcast LIVE and for free on The Rugby Channel with updates available by following @USARugby on Twitter.